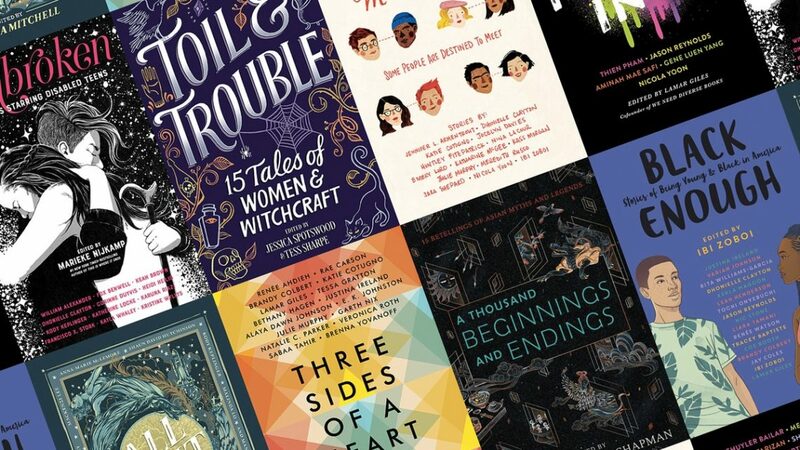 These are the kinds of relationships you can read about in some recently released young adult anthologies: Toil & Trouble: 15 Tales of Women & Witchcraft; Meet Cute: Some People Are Destined to Meet; and Unbroken: 13 Stories Starring Disabled Teens. YA anthologies like these are making space for the stories of all kinds of romantic relationships — and that’s a big win for the push for diversity in literature. That’s the reasoning behind the publication of We Need Diverse Books’ anthologies, including Fresh Ink edited by Lamar Giles, a label-defying and genre-bending collection that includes short stories, a graphic novella, and a one-act play. “Getting published in an anthology means getting your name out there,” says Elsie Chapman, a YA author who co-edited the YA anthologies A Thousand Beginnings and Endings and Hungry Hearts. In editing A Thousand Beginnings and Endings, Chapman and her co-editor Caroline Richmond intentionally sought out up-and-coming marginalized authors. “We often say that everyone deserves their own love story if they want one, and I think anthologies allow readers to imagine themselves into love stories that reflect them and who they love,” says Katherine Locke, an author who contributed to Unbroken: 13 Stories Starring Disabled Teens and who is contributing to and co-editing the forthcoming anthology, It’s A Whole Spiel: Love, Latkes and Other Jewish Stories. Another unexpected benefit of anthologies is that they enable authors to work with tropes in unexpected ways. “Marginalized authors are finally allowed to explore any option, when they don’t have to be (or feel like they have to be) a good representative of their marginalization!” says Saundra Mitchell. This gives authors room to experiment with form and style, to lean into tropes that have become tired by giving them a new lens. In Meet Cute, authors challenged the idea that a "meet cute" has to happen between one white boy and one white girl. In Three Sides of a Heart: Stories about Love Triangles, authors redefined the love triangle, a trope that has always reigned supreme in young adult fiction. In Black Enough: Stories of Being Young & Black in America edited by Ibi Zoboi and (Don’t) Call Me Crazy: 33 Voices Start the Conversation about Mental Health edited by Kelly Jensen, writers explored what it means to have relationships as a young Black person or a neurodivergent teen. There’s no hard data that proves whether or not the publication of anthologies is encouraging the book industry to greenlight more feature-length novels that center on diverse relationships, but the current landscape seems promising. If publishing more YA anthologies means breaking down barriers for marginalized authors and widening the scope of what relationships in literature look like, perhaps it’s time to turn the moment into a movement. Is O2 network down, are Giffgaff, Sky and Tesco Mobile services affected too and when will 4G data connections be back online?